Knife books often contain valuable information that cannot be found anywhere else. 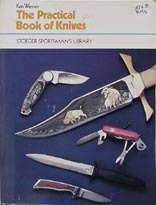 Practical Book of Knives By Ken Warner ©1976 Out-of-print. The cover has a piece of tape across the top right corner and a small bend.